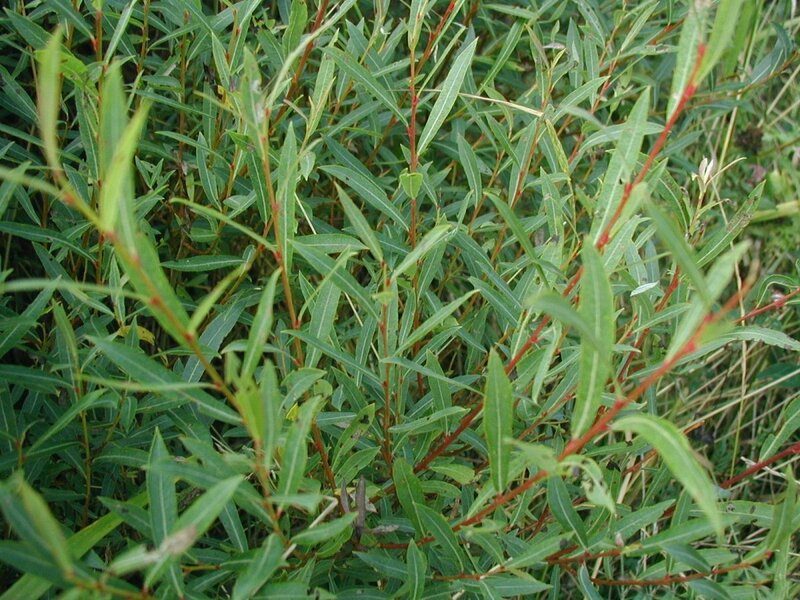 Salix purpurea is a shrub to 2.5 m tall, many-stemmed, slender, greenish-yellow, occasionally purplish, hairless, no stipules. Leaves alternate, linear or wider above middle, to 7 cm long, 1 cm wide, margin toothed toward tip pointed, base tapered, stalk short, dull dark green above, waxy dark blue-green below, tending to be subopposite at tips of twigs. Flowers in catkins bloom before stem leaves emerge, to 3.5 cm long, 0.8 cm wide, stalkless, scales blackish. Fruit a dry capsule to 0.4 cm. Habitat: Planted along streams for erosion control, soil pH 5.5-7.5 (USDA, NRCS 2010); rarely escaping.